Learn physics, chemistry, and biology in your own backyard! 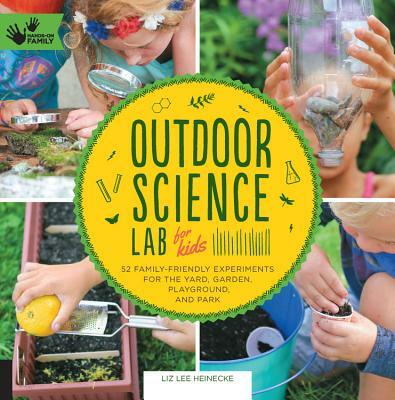 In Outdoor Science Lab for Kids, scientist and mom Liz Heinecke has created 52 family-friendly labs designed to get you and yours outside in every season. the laws of physics by constructing and using a marshmallow catapult. centripetal forces by swinging a sock filled with gelatin snack and marbles. earthworms by using ground mustard seed dissolved in water to make them wriggle to the surface. germination by sprouting a sapling from a pinecone or tree seed. surface tension and capillary action by growing baking soda stalagmites and stalactites. Many of the simple and inexpensive experiments are safe enough for toddlers, yet exciting enough for older kids, so families can discover the joy of science and STEM education together.